The parted kernels made into an electuary, or the milk drawn from them, with honey water, relieves an old cough. The dried husks and red skin of the kernels to the weight of two drachms , taken in red wine, restrain profuse menstruation. Nuts do not cause shortness of breath. For how can that which strengthens the lungs cause shortness of breath? 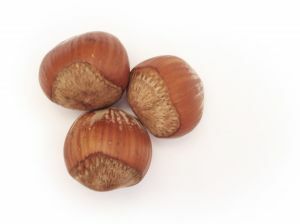 If any thing of the Hazelnut be stopping, it is the husks and shells, and nobody is so mad as to eat them, unless medicinally; and the red skin which covers the kernel, you may easily pull off.